Jean-Claude Carrière - scriptwriter and friend - and Juan Luis Buñuel - son and artist - travel to the places in Spain, France, Mexico and the US which were important for the life and imaginary of Luis Buñuel (1900-1983) and recount his visions as well as his private and professional life. An outstanding portrait of one of the most fascinating and universal personalities and artists of the 20th century, with unpublished fotos and footage material. The film approaches the life and works of the great director biographically and in an unconventional way: Two of his closest confidants and the best living contemporary witnesses of Buñuel, the famous script writer and Buñuel's longtime collaborator Jean-Claude Carrière as well as Buñuel’s son, himself filmmaker and artist Juan Luis Buñuel, travel on the tracks of the Spanish director. 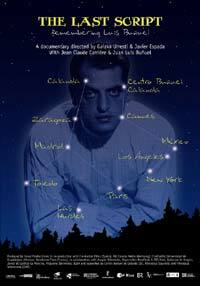 At the places in Spain, France, Mexico and the US which shaped Buñuel’s life, they remember the colleague and father by talking about his modus operandi, his notions of the world and about private moments. Alternating with footage material and unpublished photos, their stories create an individual and personal portrait of one of the most fascinating personalities and artists of the 20th century.